The 2018 IMSA WeatherTech SportsCar Championship opened at Daytona International Speedway in January with the traditional Rolex-24. It was followed by the historic 12-Hours of Sebring, Long Beach, Mid-Ohio, Detroit, Watkins Glen, Canadian Tire Motorsport Park, Lime Rock, Road America, Virginia International Raceway, Mazda Raceway Laguna Seca and a 10-hour finale called Petit Le Mans at Road Atlanta. 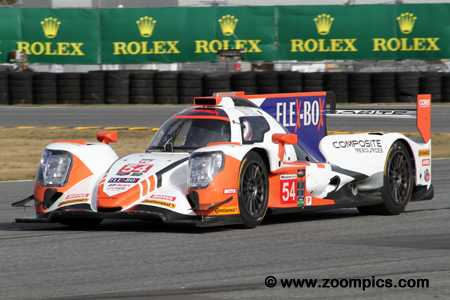 Prototype (P) – These are purpose built race cars and the quickest in the series. Significant changes were implemented to this category in 2017. It included cars constructed to one of two different sets of rules – Daytona Prototype International (DPi) and Le Mans Prototype 2 (P2). The DPi category includes the Cadillac DPi-V.R, Nissan DPi, Acura DPi and Mazda RT24-P. This class allows manufacturers to use their engines. All the P2 cars are powered by a 3.8-liter Gibson V8 engine. Competitors are using chassis’ from ORECA, Ligier and Riley Technologies. Grand Touring Le Mans (GTLM) – Cars in this class are highly modified production vehicles from manufacturers such as Ferrari, Porsche, Chevrolet and BMW. As a result, a wide range of engine configurations and displacements are employed. The series technical staff uses a number of methods to ensure that teams are competing on a ‘level playing field.’ Most of the teams racing in this group are receiving factory support. Grand Touring Daytona (GTD) – This is also a production based class but does not allow the same level of technological improvements that can be made to Grand Touring Le Mans cars. Vehicles in the category include Audi R8 LMS GT3, Porsche 911 GT3 R, Ferrari 488 GT3, BMW M6 GT3, Acura NSX GT3, Lamborghini Huracan GT3, Mercedes AMG GT3, Lexus RCF GT3 and Aston Martin Vantage. Similar to Grand Touring Le Mans, the IMSA technical staff uses a number of methods to ensure parity. 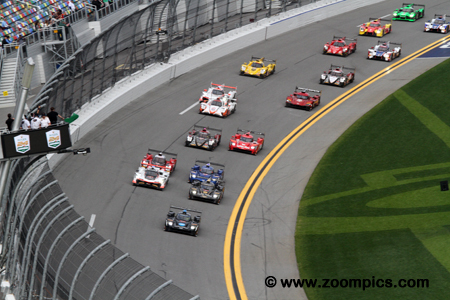 The 56th Rolex 24 at Daytona took place on the weekend of January 27 and 28. There was a total of 50-starters (20-Prototypes, 9-GT Le Mans and 21-GT Daytona). Drivers would compete for 24-hours on the 12-turn, 3.56-mile track which utilized an infield road course and almost the entire tri-oval. 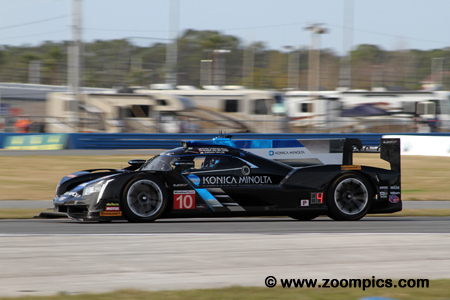 Pole-sitter, Renger van Der Zande driving the Konica Minolta sponsored Cadillac DPi-V.R jumps into the lead at the drop of the Starter’s flag. Sharing the front row with van Der Zande in the Acura Team Penske Acura ARX-05 was Helio Castroneves. There were a total of fifty entries competing in the fifty-sixth running of the Rolex 24 at Daytona International Speedway. The driving duties for the race winning Cadillac DPi-V.R were shared by Joao Barbosa, Felipe Albuquerque and Christian Fittipaldi. Albuquerque was third quickest in the qualifying session. The trio dominated the event – leading 579 of 808-laps including the final 293-circuits. In addition to winning the fifty-sixth edition of the event, they set a new record for the greatest distance traveled - 2,876.48-miles. 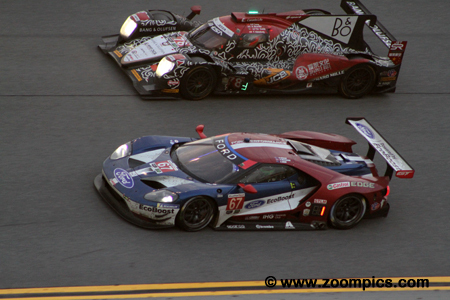 Chip Ganassi Racing entered two Ford GTs in the Grand Touring Le Mans (GTLM) category. After twenty-four hours of racing the No. 67 Ford driven by IndyCar competitor, Scott Dixon and series regulars, Richard Westbrook and Ryan Briscoe captured the class victory. The trio started fifth in the GTLM group but a trouble-free run allowed them to stay in contention and take the lead during the final pit-stop. Driving the No. 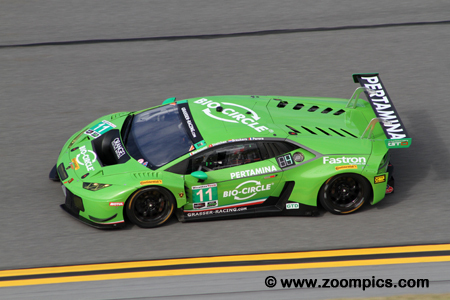 11 Grasser Racing Team Lamborghini Huracan GT3, Mirko Bortolotti, the 2017 Blancpain champion, was third quickest in the Grand Touring Daytona (GTD) qualifying session. Partnering with Bortolotti during the race were Franck Perera, Rik Breukers and Rolf Ineichen. Always running with the front runners, Bortolotti led the final fifty-two laps. 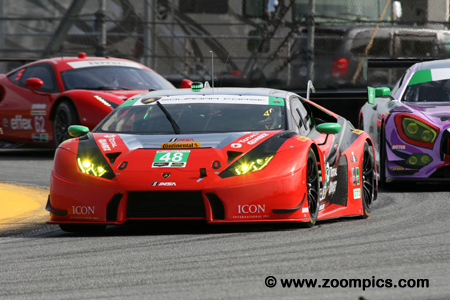 This was Lamborghini’s first victory in the Rolex 24. After a successful racing career which included championships in Trans Am, IMSA and Grand-Am, Scott Pruett was making the 2018 Rolex 24 his final race. Pruett who had five victories in the twenty-four-hour event was teamed with David Heinemeier-Hansson, Dominik Farnbacher and Jack Hawksworth. They shared the No. 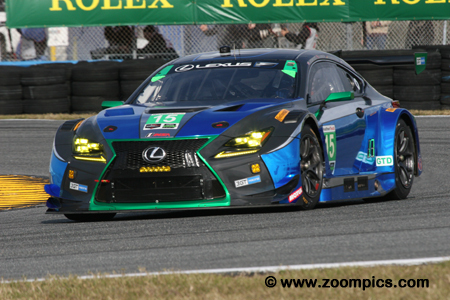 15 3GT Racing Lexus RC F GT3 and finished twenty-ninth overall and ninth in class. The quicker of the two Michael Shank Racing Acura NSX GT3s was the No. 86 entry raced by Alvaro Parente, Katherine Legge, AJ Allmendinger and Trent Hindman. 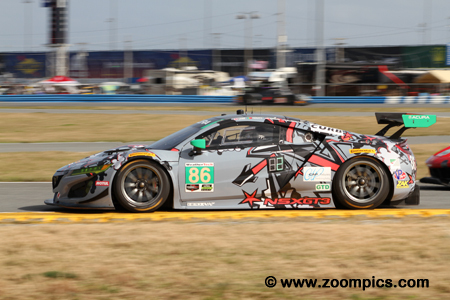 The NSX was gridded thirty-fourth overall and seventh in class for the start. During the event, the team led a total of fifty-two laps. 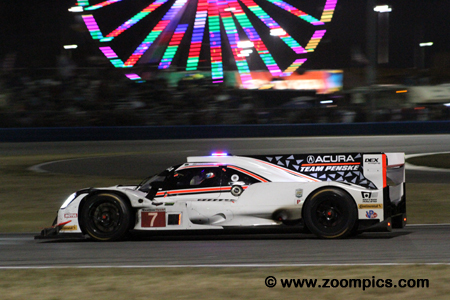 At the conclusion of twenty-four hours of racing, the Shank Acura finished second - 16.806-seconds behind the winners. The No. 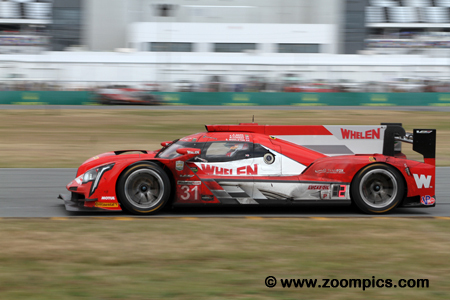 31 Whelen Engineering Racing entry was driven by Eric Curran, Stuart Middleton, Mike Conway and Felipe Nasr. The Cadillac DPi-V.R was less than half a second slower than the pole-winning time but in such a competitive field it was only good enough for a seventh place start. The team kept pace with the leaders for twenty-four hours and captured the runner-up spot – just 70.544-seconds behind the winners. 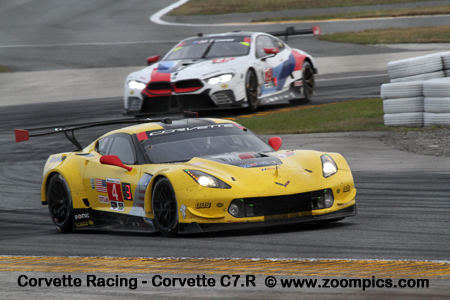 The only car finishing on the same lap as the winning GTLM Ford GT were their teammates in the No. 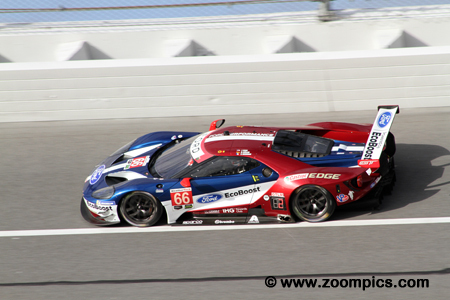 66 Chip Ganassi entry. This car which started second in class was driven by Dirk Mueller, Joey Hand and IndyCar competitor, Sebastien Bourdais. They led GTLM until the final pit-stop when an issue engaging first gear slowed their progress and allowed their teammates to grab first place and the victory. Roger Penske entered two of the new Acura ARX-05 with a stellar driver line-up – Helio Castroneves, Graham Rahal, JP Montoya, Ricky Taylor, Dane Cameron and Simon Pagenaud. In the final moments of qualifying it appeared that Castroneves had secured the pole, however, Renger van Der Zande was 0.007-seconds quicker. Although they led the race, both Acuras encountered issues which took them out of contention. Paul Miller Racing was the second quickest Lamborghini Huracan entry but their time was only good enough forty-third overall and sixteenth in the GTD category. By the halfway point of the contest, drivers Bryce Miller, Andrea Caldarelli, Bryan Sellers and Madison Snow had moved to third in GTD. They were able to stay with the lead group for the remainder of the contest and finished third in class. 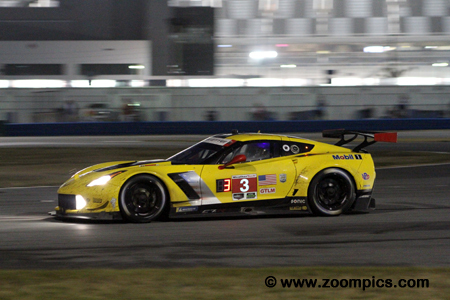 Jan Magnussen piloting the Corvette Racing Chevrolet Corvette C7.R was just 0.019-seconds quicker than Joey Hand in qualifying a grabbed the GTLM pole position. Mike Rockenfeller and Magnussen’s regular co-driver, Antonio Garcia also drove the No. 3 Corvette. Unable to maintain the pace of the quicker Ford GTs this squad finished thirteenth overall and third in category – two-laps behind the class winning Ford. Local entry the ‘Spirit of Daytona’ had a promising start to the event. In qualifying, Tristan Vautier drove the team’s Cadillac DPi-V.R and recorded the fifth quickest time. He followed this up by turning the fastest time during the Thursday evening practice session. Sharing the car with Vautier were Matt McMurry and Edward Cheever. Unfortunately, the car was the first to retire after the team unable to resolve a misfire. After years of success in the Le Mans Prototype Challenge category, CORE Autosport competed at the Grand Touring level with Porsche. In 2018, the team made the decision to join the Prototype ranks and entered an ORECA LMP2. 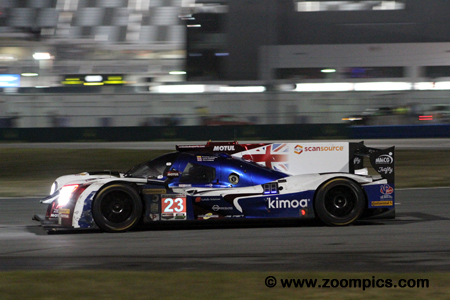 The ORECA was raced by Romain Dumas, Colin Braun, Loic Duval and team principal, Jon Bennett. The team had a remarkable debut – finishing in third place and on the lead lap. 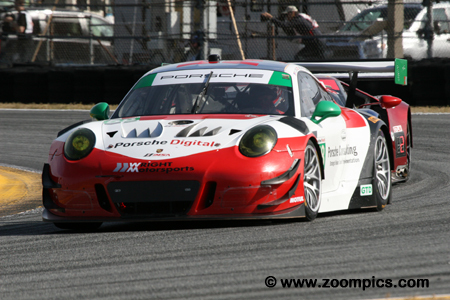 A team expected to challenge for the GTD class win was the No. 58 Wright Motorsports Porsche 911 GT3 R. After a successful stint in the Pirelli World Challenge series the team moved to the WeatherTech Challenge for the 2018 season. The driver line-up included Mathieu Jaminet, Robert Renauer, Patrick Long and Christina Nielsen. Unfortunately, heavy damage on the formation lap meant the team was never a threat. Making the headlines leading up to this year’s Rolex 24 was the participation of two-time Formula 1 Champion, Fernando Alonso. Alonso was entered in the United Autosports Ligier LMP2 and shared the driving with Lando Norris and Phil Hanson. Alonso handled the qualifying and was thirteenth quickest. During the race, he led a couple laps but the team encountered problems and dropped out of contention. Just when it looked as though Helio Castroneves had secured the pole position, Renger van Der Zande driving the No. 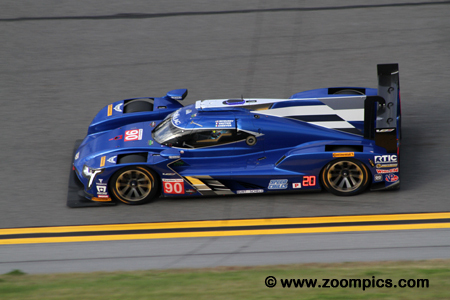 10 Cadillac DPi-V.R turned a lap time 0.007-seconds quicker. Sharing the driving with van Der Zande were Jordan Taylor and Ryan Hunter-Reay. After suffering five flat tires during the race, team principal, Wayne Taylor decided to withdraw the car – citing his concern for the drivers and car.